Having seen a number of documentaries and film dramas about art forgeries and hoaxes in general and Jackson Pollock in particular, I uncharacteristically went into Bakersfield Mist with a number of expectations and preconceived notions of what I was about to see. It turns out that was exactly the right state of mind to be in. “Undiscovered” paintings by well-known artists are the holy grail and the bane of art experts. In Bakersfield Mist , noted “fake-buster” Lionel Percy knows in an instant—before he even arrives at Maude Gutman’s trailer, in fact—that her junk-shop find isn’t worth the canvas it’s painted on. But Maude has a few tricks up her leopard-print sleeve, not to mention the ones hiding in plain sight. 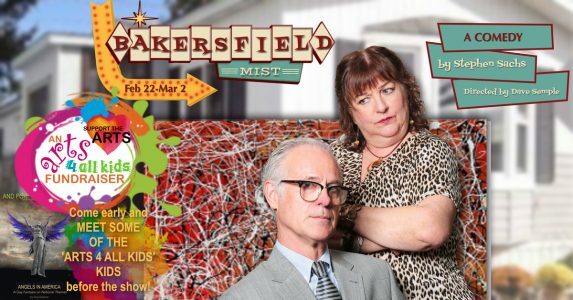 Bakersfield Mist is the polar opposite of Calithumpian’s Red , which was a cerebral investigation of the creative process. Here, Deborah Mitchell is a foul-mouthed, whiskey-loving ex-bartender who knows she’s got a $3 Pollock up against George Jolink’s ever-so-proper former museum director (think Niles Crane, but stuffy) in a battle of emotion, intuition, wits, and wittiness. The script leaves no callback uncalled-back, but it’s funny and surprising nevertheless. Based on Bakersfield Mist , Who the #$&% Is Jackson Pollock? , the documentary that inspired the play, is next on the list of films about art that I want to see. I’d suggest that the play, a combined fundraiser for Arts 4 All Kids and Calithumpian’s upcoming production of Angels in America , be next on your list of theatre shows to catch. Peter Janes is a London-based producer, director, and playwright, and a board member of the London Fringe Theatre Festival. He was also a member of the Brickenden Awards adjudication panel, and was a co-founder of the Troubadour Theatre Collective. Since 2008 he has been the editor and webmaster of Theatre in London.ca. Thanks for attending the opening last night, Peter! As always, we are appreciative of your hard work and contributions to London’s community theatre here on ‘Theatre In London’.